As we read our monastery chronicles at Friday night supper it really is amazing how many things have stayed the same. 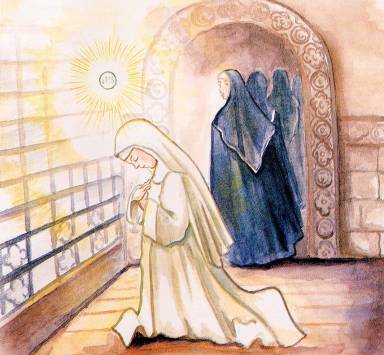 The format of our Rosary Sunday Pilgrimages haven't changed much, neither have our customs for celebrating the Prioress' feast day. The other night the reader began reading the heading, "Reverend Mother's Feast". Such an entry is in probably every year of the chronicle and there is little variety except for the name of the prioress and the feast day. With the changes made in the Divine Office many dates of the feasts of the saints were changed, one of these was the feast of Blessed Imelda, our dear Reverend Mother's Patron. Formerly this feast was kept on the sixteenth of September, but now according to the new ordo it was to be celebrated on the thirteenth of Mary. This rather innocuous entry could have been written in the late 60's or even today as the Church Calender went through a major upheaval as part of the liturgical changes in the 60's. Even to this day on certain feasts one will hear, "Well she (he) used to be on such-and-such a day but they changed it to today. I wish they hadn't!" So, we did find it a bit amusing to read this entry which is a reflection of the changes made by Pope St. Pius X to the liturgical calender. Probably Blessed Imelda, named patron saint of First Communicants was moved to May since most First Holy Communions occur in May, often on her feast day. February Vacation...Tis the Season For A Nun Run!